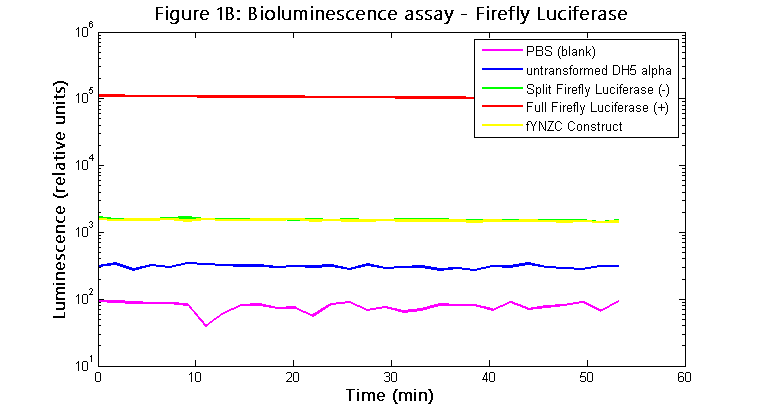 This construct aimed to test the efficiency of split Firefly luciferase, by performing a complementation assay using the chemotaxis associated proteins CheY and CheZ in E.Coli. CheY and CheZ are two proteins involved in the bacterial chemotaxis pathway. 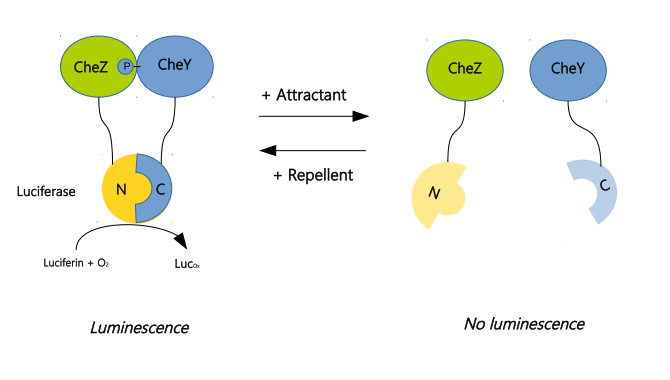 It has been shown by split luciferase complementation assay that these two proteins are not interacting in presence of chemoattractant, but start to interact (CheZ being the phosphatase of CheY) in absence of chemoattractant or presence of chemorepellent. Based on the work of Waldor Laboratory, we wanted to redo and adapt the experiment to test our own splits. To proceed to this complementation assay, we built a construct to test split Firefly Luciferase.The CheY was fused to the N-terminal part of the split, while the CheZ was fused to the C-terminal part. We used the full luciferase (BBa_K1486022) as positive controls and the non-fused splits (BBa_K1486021) as a negative control. As shown in the graph below, we couldn't really observe a high signal for our complementation assay. However, the signal being higher than the blanks, it is an encouraging sign that the split luciferase can be used for other experiments of this kind. A possible explanation for these results is that arabinose being a chemoattractant, we might need to do more wash steps with PBS to get rid of the arabinose before taking the measurements. Moreover, CheY and CheZ being endogenously expressed in bacteria, the edogenous proteins could interfere with our fusion proteins and weaken our signal. This complementation assay should be tested with CheY/CheZ knock out strains, as it was done in Waldor Laboratory.